With the motto of “no money equals no stress”, CovertCandy is a revolutionary community that allows its members to trade almost any item in the absence of money. From clothes to books to electronics and back, CovertCandy has it all. With an ever-expanding community and bright prospects for the future the business presented an exciting challenge for The Practice team. Originally CovertCandy was a vintage clothing trading community, geared towards young women. Looking to expand their trading horizons the business needed a new design/logo that was welcoming to all demographics. Our ambition was to have the website design reflect the ethos of the business. 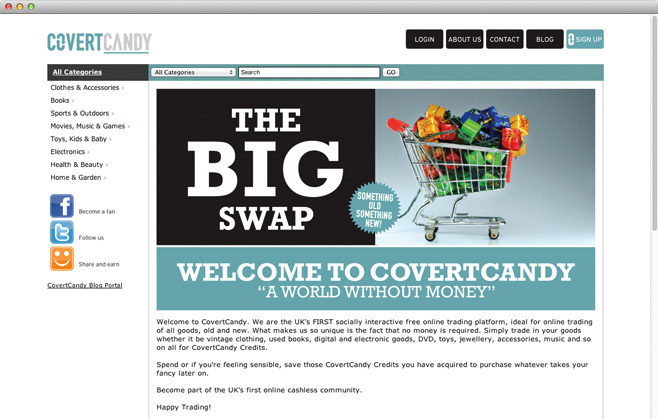 With its focus on community, the social media integration of CovertCandy was important. The website was designed to be as clean and user-friendly as possible, again keeping in line with the CovertCandy stress-free attitude!